Somebody has to pay for all this, y’know? 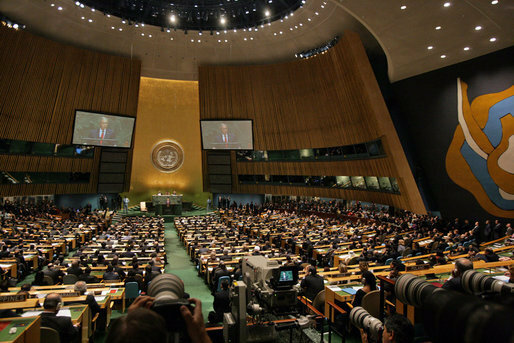 The U.N. General Assembly just passed a landmark global treaty on arms sales. First reports indicated that the Bolivarian Republic of Venezuela abstained, which was perhaps not surprising given their love of buying fancy new weapons. But it later emerged that the Venezuelan delegation didn’t even vote at all. So, why didn’t the Venezuelan government, which has pledged to protect planetary peace and universal equilibrium, participate in such an important vote for the world? Turns out the B.R. of V wasn’t allowed to vote because…we haven’t paid our U.N. dues! A quick explanation: The funding of the United Nations comes from contributions by all member states and it’s based on each country’s capacity to pay in relation with its gross national income (GNI). For example, the U.S. pays the 22 % of this year’s budget, while least developed nations are allowed to pay just 0,01%. Venezuela’s contribution is 0.627%. But according to U.N.-watcher blog Juris Novus (in Spanish), a letter from the U.N. Secretary General sent last January to the General Assembly indicated that Venezuela and other 21 countries are in serious arrears and, until they pay, they won’t vote in the current General Assembly session. Some small countries from Africa had this penalty waived. The Bolivarian Republic of Venezuela has to cough up $5,113,575 if we want to regain the right to vote in the UNGA. Amazingly, we top the list with the biggest maulas, since we’ve been building up arrears over two years. In a distant second comes… Somalia. Oh wait! That would be Nicolás Maduro. Nevermind.